Which countries have the most solar panels in 2016? What countries use the most Solar Panels? 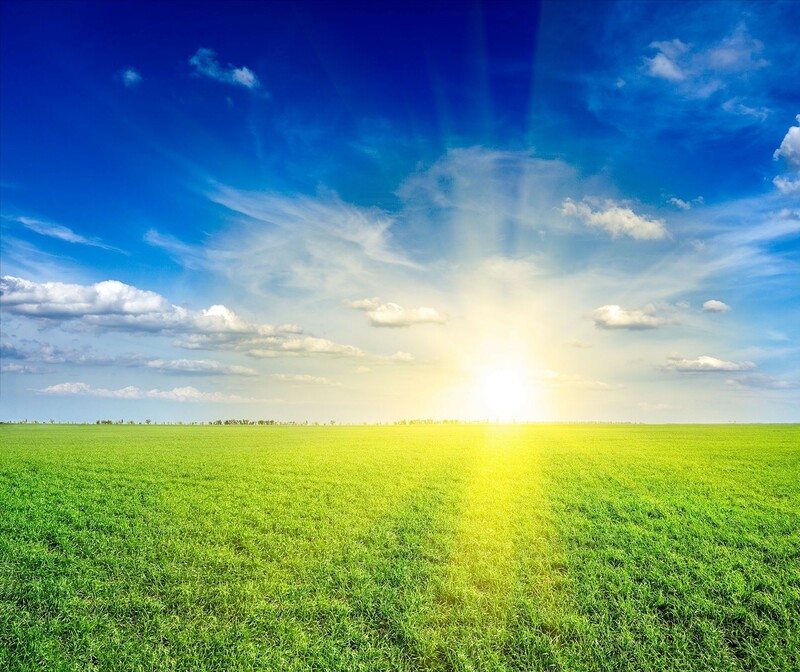 Solar power is one of the world’s leading renewable electricity providers, and in recent years the solar panel industry has seen dramatic increases in both domestic and commercial installations. The increase in solar panel use throughout the world has been assisted by a number of factors, including decreased photovoltaic manufacturing costs and government backed schemes that encourage the use of solar panels with financial incentives. In 2010, the total worldwide solar photovoltaic electricity capacity was 40,336 megawatts, however just 6 years later, our capacity is now over 200,000 MW, an impressive increase of almost 500%. For many years, Germany had been leading the world with the largest solar photovoltaic panel capacity, but 2016 has seen China surpass Germany for the first time, with a capacity of 43,000 MW. What countries have the highest installed solar PV capacity (in MW)? The table below indicates the total capacity (measured in MW) of installed solar panels in each respective country, based on current figures for 2016. What countries have the most solar photovoltaic panels installed? What countries have the most solar photovoltaic panels installed per capita? When looking at the countries with the highest number of solar panels installed per capita, many of the countries with the highest total solar pv capacity do not appear in the top 10, including China, France, Spain and the USA. Below are the 20 leading countries for installed solar capacity per capita, with the figures displaying the number of solar panels per person. What influences the use of solar panels? Government’s play a substantial role in whether a society chooses to implement and use solar panels. 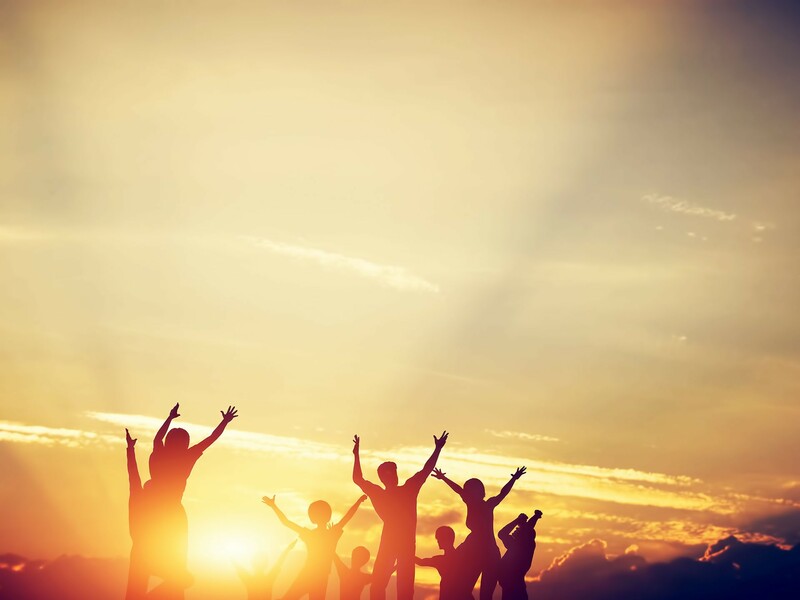 Many governments across the world have positive and often lucrative grants and incentives, such as a feed-in tariff scheme, which pay solar panel owners a fixed rate for every unit of electricity they produce. Most of the countries at the top of the list provide subsidies, grants or financial incentives to encourage domestic installations of solar panels, and often these incentives also extend to larger commercial solar panel farms. However, the countries towards the end of the list, with smaller solar PV capacities, often do not have similar incentives in place. Governments also have environmental and electricity targets which must be met. In many countries on our list, the ruling governments have tenders with solar PV firms to install large scale solar panel farms. Surprisingly, the countries with the highest solar panel capacities are generally outside the areas considered to have the best solar PV potential. 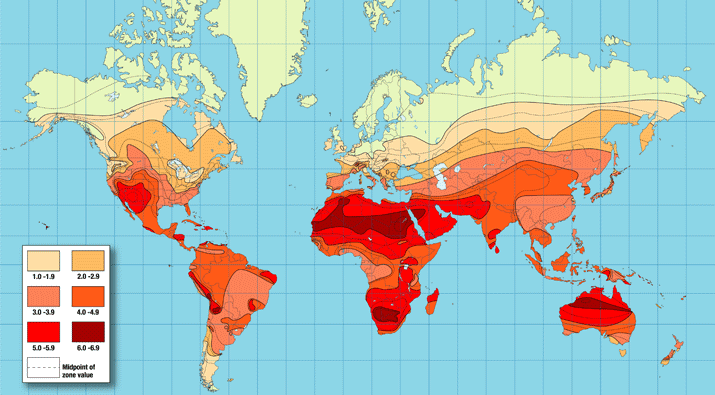 When considering where in the world has the best solar photovoltaic potential, most people are guided by solar radiation, also known as insolation. Insolation is the solar radiation that reaches the earth’s surface, and as solar panels mostly require UV and infrared radiation to generate electricity, the higher the radiation, the more electricity the solar PV panels will produce. As of 2016, China has passed Germany and now has the most solar panels, with a solar PV capacity of 43,000 MW. Since 2007, China has had ambitious goals for the introduction of widespread solar power, with strong backing from multiple government parties and commissions. In 2011, China only had a solar panel capacity of 2,500 MW, but in 2012 and 2013 the capacity doubled. China has no plans to slow their use and installation of solar panels, with aims to reach 70,000 MW by 2017 and 100,000 MW by 2018. Not only is China the world leader for using solar panels, they also produce more panels than any other country. 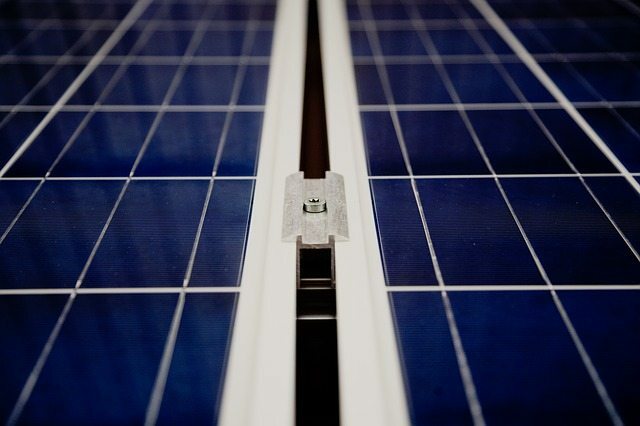 Of all the solar panels produced around the globe, more than 50% are manufactured in China. China are the leaders in solar panel manufacturing and installations, and have ambitious plans to substantially increase the use of sustainable solar power. For quite some time, Germany led the world with the largest solar panel capacity, but they were recently surpassed by China. Germany has an impressive 39,628 MW solar PV capacity, which produces enough solar power to provide 3% of Germany’s electricity. Germany’s solar panels represent 19.8% of the world’s total solar PV capacity, and have plans to increase the total capacity to 66,000 MW by 2030. 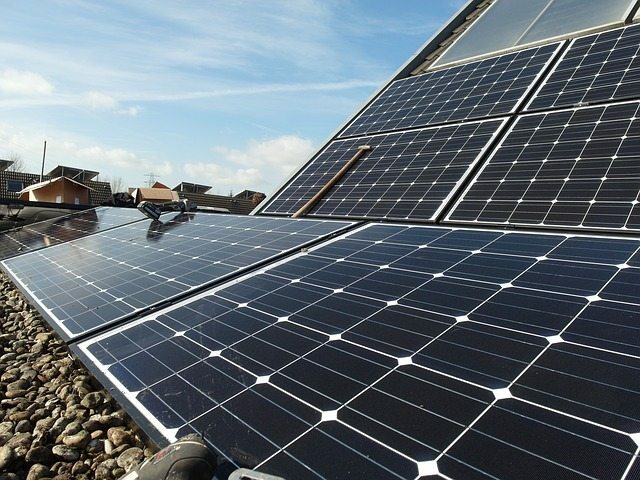 One of the main reasons solar panels are so widely used in Germany is due to the feed-in tariff, that is available to both domestic and commercial solar panel owners. The feed-in tariff provides lucrative financial returns for generating solar power and putting surplus electricity back on to the grid. In recent years, the number of new solar panel installations in many European countries has grown exponentially, mostly due to incentive and feed-in tariff schemes. These schemes have worked extremely well, and increased the number of solar panels installed on buildings and homes, as well as the introduction of solar panel farms in many locations. Government backed incentive schemes have worked extremely well in Italy, France, Spain and the United Kingdom. In Italy, solar power now represents more than 7.5% of electricity consumed, and solar power now costs the same as energy from non-renewable sources, such as coal. In recent years, the U.S. has had substantial growth in their solar panel capacity, and are one of the biggest users and manufacturers of solar photovoltaics. The current capacity can provide power to over 4 million homes, and photovoltaics continue to rapidly expand in many American states, including California, Arizona, Colorado and New Mexico, with sizeable solar panel farms and high levels of domestic installations. The U.S. is also leading the way for the development of new solar panel technologies, such as the Tesla Powerwall, which will allow solar power to be stored for use when the sun isn’t shining. What is the worldwide solar panel capacity? The world’s solar panel capacity has grown exponentially since the turn of the century, with many countries turning to renewable energy technology to reduce carbon emissions and increase green electricity production. Solar panels are the third highest producers of renewable electricity, behind hydro and wind power, but lead the way in domestic applications throughout the world. With the rapid growth of solar panel use around the world, the current capacity is now over 200,000, which is an astonishing achievement, and helped greatly by top ten countries in the table above. We can expect the number of solar panels in the world to continue their explosive growth, with many countries revealing ambitious solar PV capacity targets, including China’s target of 100,000 MW by 2018. 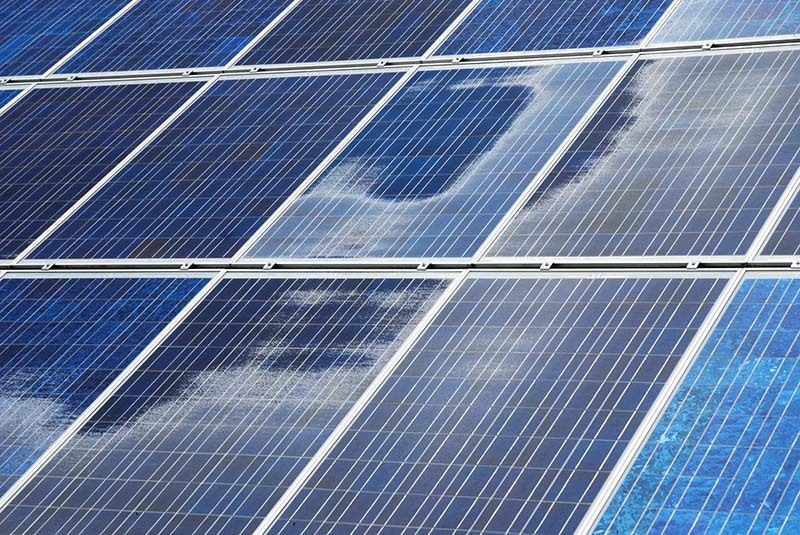 There are a number of countries throughout asia, including Thailand and Indonesia, who are just starting to move away from traditional electricity production to focus on photovoltaics. Which European countries have the most solar panels? Most countries in Europe have embraced solar panels in recent years, and Germany had been leading the world with its solar PV capacity for several years. There is a strong link between financial incentive schemes and the use of solar panels throughout European countries. Here are the countries in Europe which use the most solar panels. Which European countries have the least solar panels? The countries with the lowest uptake of solar panels in Europe reflect the government assisted grants and schemes that have been employed, such as a feed-in tariff scheme. These countries with the lowest solar panel capacity in Europe generally do not have a solar PV scheme or incentive. Where are the biggest solar panel farms? In terms of solar panel capacity, China is leading the world with more than 43,000 Megawatts. As well as boasting the largest total capacity, China also has the largest solar panel farm in the world. Longyangxia Dam Solar Park has a capacity of 850 MW, which is almost 300 MW more than its next closest rival. However, whilst China does have some impressive solar panel stats, they are lacking when considering the number of solar panels per capita, in which they do not feature in the top 20. We now head over to Germany, which has the second highest capacity. Germany has a high commitment to solar panel and renewable energy, and even has solar panels on the Reichstag Government Building. Germany has an impressive capacity of almost 40,000 MW, and also has more solar panels per capita than any other country. In terms of solar panel insolence (the places with the best solar panel potential), many countries across Northern Africa and North Central Africa provide the best potential. Unfortunately, these countries rank outside of the highest capacity nations. As well as central South Africa, flying over to Qatar and the Middle East are countries with a lot of potential, thanks to their numerous days of high sunlight and little cloud coverage.